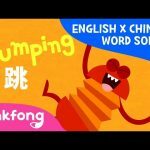 You are watching “Purple Fruits (紫色水果)”, a super fun English and Chinese word song created by Pinkfong! Happy happy. Wa ha ha! Sad sad. Boo hoo hoo! Surprised surprised. Gee gee gee! I laugh when I am happy. I frown when I am angry. I jump up when I am surprised.